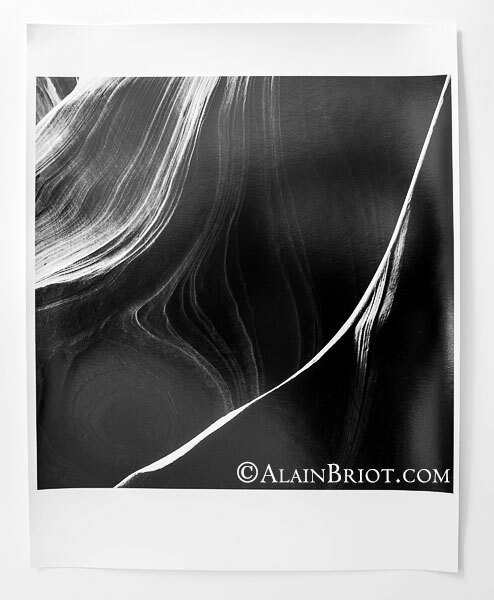 This essay features a variety of examples of black and white abstract photographs. These examples are presented by categories of images. These categories are organized by subject. For each subject I describe the type of abstraction that I used and the motivation that led to the creation of these images. I also talk about the experiences associated with the creation of the images presented in this essay. 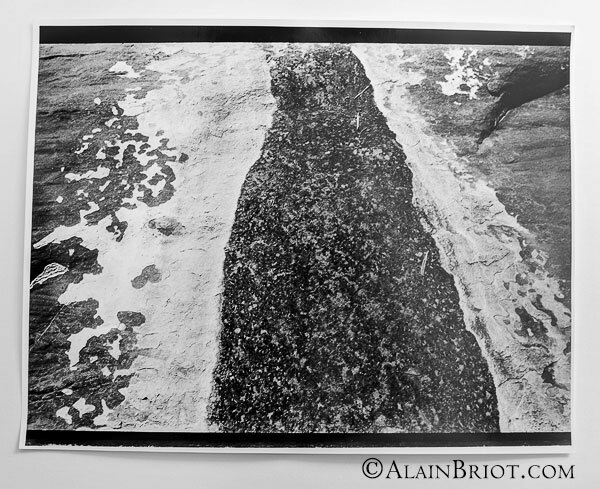 Initially, when I started working on an essay featuring examples of abstract photographs, my idea was to feature both color and black and white images in the same article. However, as the writing moved along, I realized that I had only a couple of black and white examples on my computer. As I thought about this I remembered several black and white abstract photographs that I had taken on film but that I had never digitized or scanned. This led to doing research in my print files and in turn this led to the ‘discovery’ of many abstract black and white silver prints. 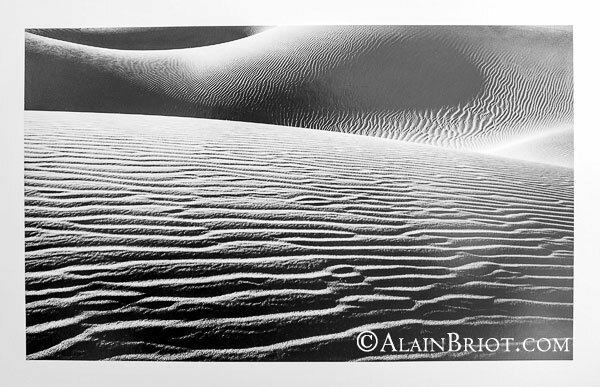 These are early prints, created between 1986 and 1992 for the most part, before I started my photography business. Most of these images were taken with a Hasselblad V camera, some with a Leica CL, and a few with an Olympus OM-1 and OM-2. For the purposes of this essay the kind of camera I used is somewhat irrelevant. What is important are the images. 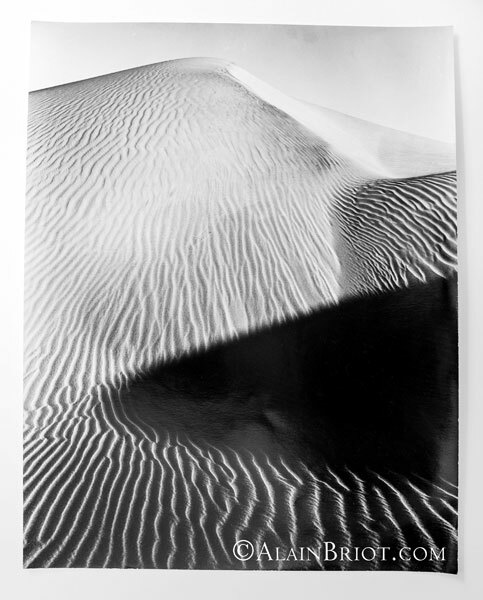 All the examples featured here are photographs of black and white silver prints. These prints were photographed casually, the goal being to feature them as illustrations for this essay and not to create digital versions for reproduction. For this reason the prints are shown as they came out of the storage boxes in which they are kept. Some are dry mounted and therefore flat while others are not mounted and thus slightly curled. I like the organic look that loose, unflatten prints have. It is a nice contrast with digital images. These are real physical prints, not just pixels on a digital storage device. When I did the research for this essay I had not looked at the images featured here for quite some time. I had looked at my chemical prints collection when I worked on my Vision Mastery Workshop on DVD tutorial because in it I included a historical account of my photographic journey. However at that time I looked at my collection from a chronological perspective to show to students how it evolved over the years from the time I started until today. I did not look at the collection in terms of genres the way I did this time. 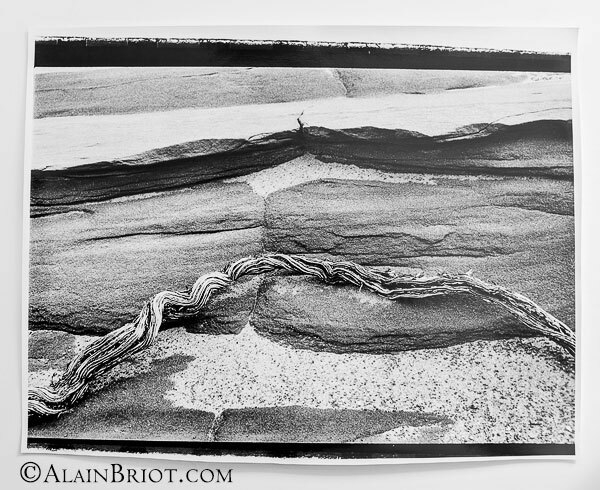 Looking specifically for abstract photographs done with black and white film meant narrowing the focus to a specific time which is roughly from 1986 to 1992. What surprised me when I looked at that section of my collection is how many abstract images I found. I was clearly doing a lot of abstract photographs at that time without really calling them abstracts. I did not have a name for them at that time because I did not separate them from my landscape photographs. 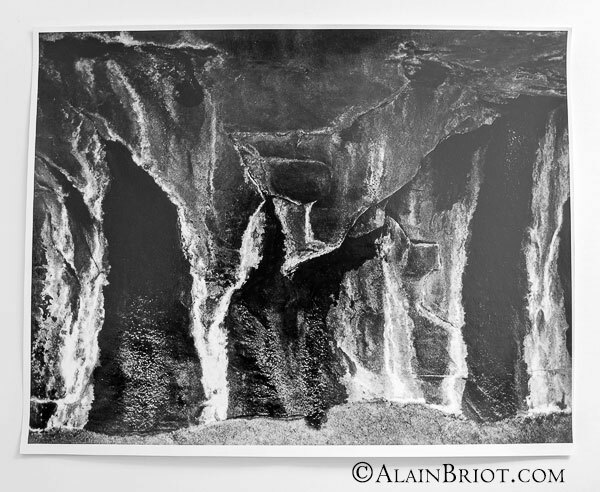 For me they were details of the landscape I was photographing and so they were part of my landscape photographs. Part of the reason for this lack of nomenclature is the fact that I was not seeking the opinion of other photographers. I was pretty much doing this on my own. I did not hang out with other photographers and I was not attending workshops. This means that I was not getting feedback on my work or any kind of advice. I could certainly have used some of that! I became aware of this when I noticed that a number of these images could be easily improved by careful cropping. Yet, I did not think of it back then. It is usually the simplest things that are the hardest to see in one’s work. I was very close to my work and I was unable to distance myself sufficiently to see my work objectively. Today, looking back at it after a number of years and at a much higher level of experience, these things jump out at me. Back then they did not. However, if I had attended a workshop or asked an experienced photographer for advice, I would most likely have heard what I see today. I also noticed that most of my prints had either too much or not enough contrast. 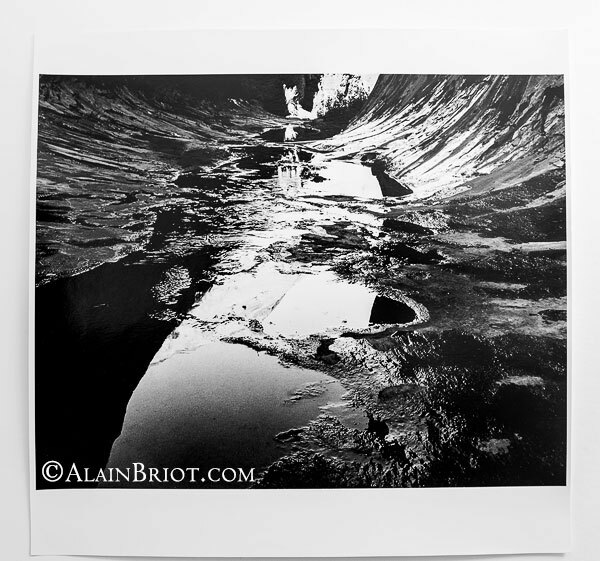 I struggled for years trying to make black and white silver prints that I found satisfying but I rarely hit the mark. Some prints were better than others of course and some were satisfying but the majority were not. Just like I now notice the need to crop some of the images, I now see that I often worked in the wrong direction back then, either increasing contrast when decreasing it was necessary, or decreasing contrast when increasing it was necessary. 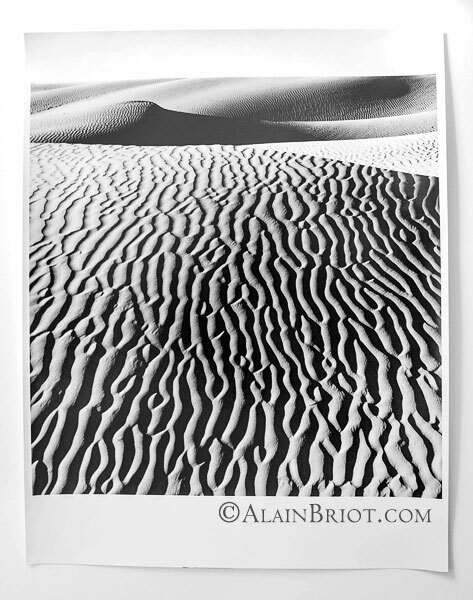 In this first set of examples the subject is easily recognizable as sand dunes. What makes these images abstract is the approach to the subject. 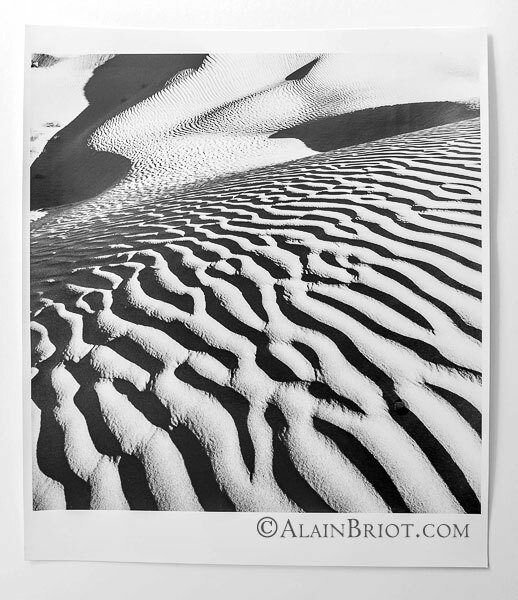 Instead of focusing on making the location identifiable, I focused on the form of the dune ripples and on their relationship to clouds or other dunes. My motivation was aesthetic rather than touristic. 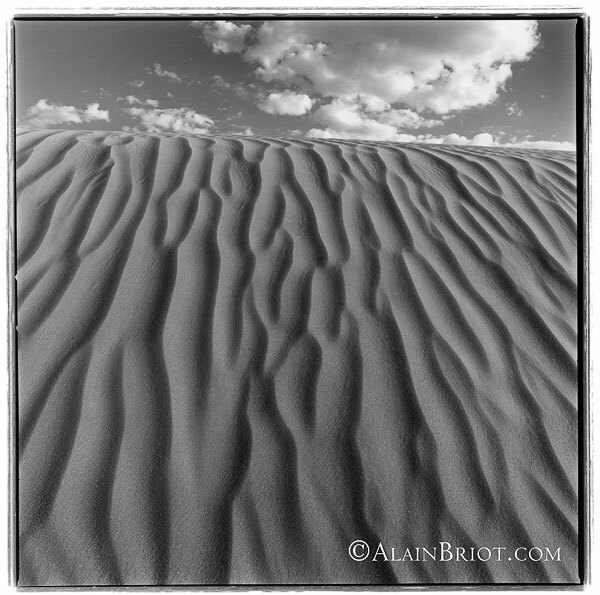 I wanted to show the beauty of the dune patterns and not publicize the location. 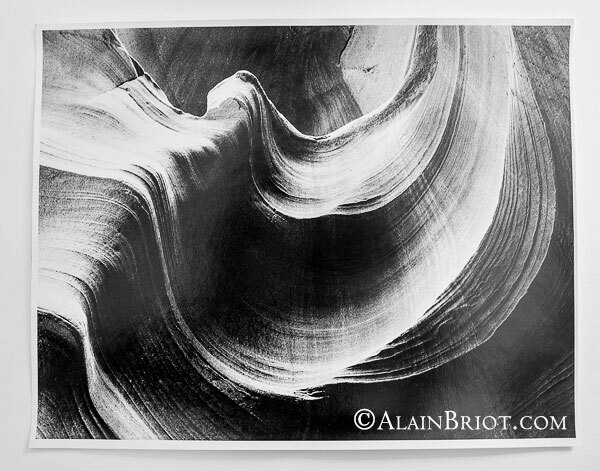 Slot Canyons, of which Antelope is the most famous, are ideal locations for abstract images. 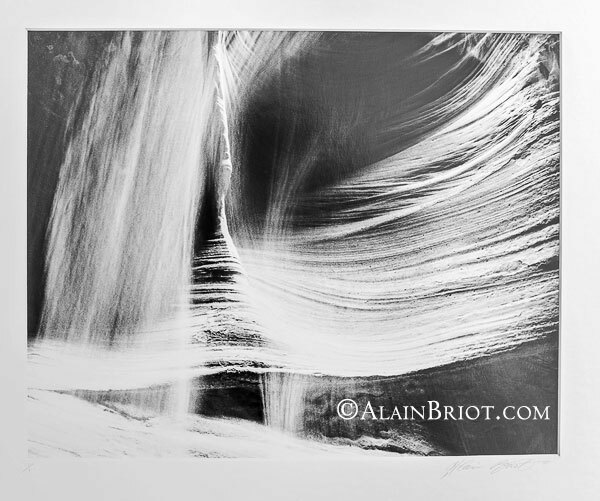 Slots are all about the lines and the form of the rocks, forms sculpted by water running through narrow cracks in the earth, eroding layers of sandstone formations. What we see today is the result of this carving process. 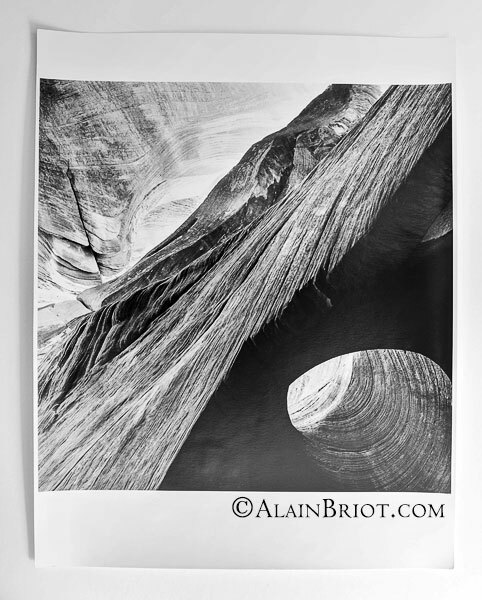 What makes slot canyons fascinating is the endless possibilities for compositions that they offer. Even though I have been in Antelope hundreds of times (my first visit was in 1986), I continue to find new compositions during each new visit. 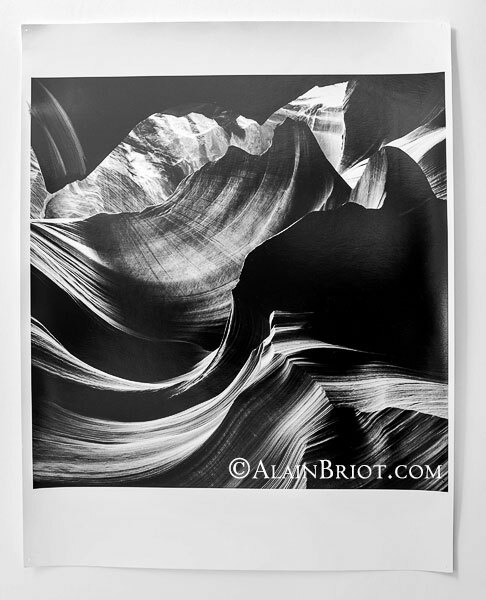 What is featured in this section are some of my first images of Antelope. While my vision of Antelope has changed over the years, I never tire of photographing it. These are not so many images of water than they are images with water. Water plays a small part in these images, most of the space being taken by rock. 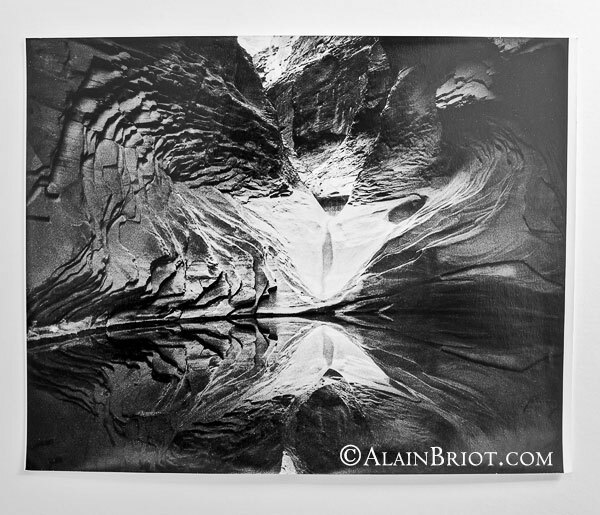 Yet, water is what creates the main patterns in these photographs and this is why I titled this section water. I added the words ‘and reflections’ because in some of these images reflections create the visual patterns that makes the photograph visually engaging. Finding appropriate categories for the images shown in this essay was challenging, not so much because they are similar but because they were never created with these categories in mind. Their creation was spurred by my inspiration and this inspiration was triggered by form and patterns, not by categories. However, for the purpose of this essay, I thought that organizing these photographs by grouping them in separate categories would be helpful. Whether this is a good idea or whether I should have kept them in a single category remains to be seen. My goal was to provide a framework for other photographers who want to try their hand at creating abstract images. In a way, if you are so inclined you can try your hand by doing this both ways. 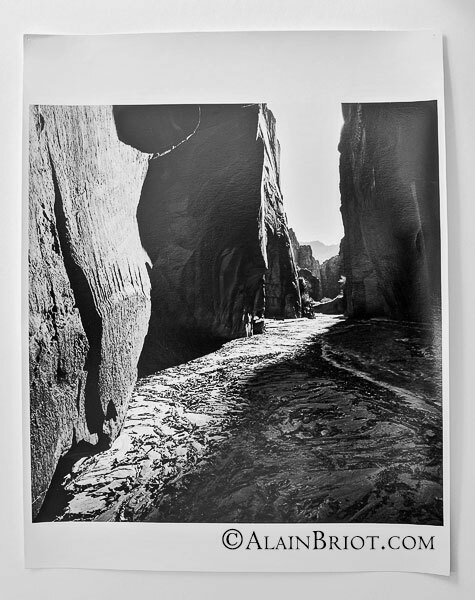 You can follow the five categories that are featured here, namely Dunes, Slot Canyons (Antelope), Water and reflections, Organic Elements and Canyon forms and details. Or you can look for form and patterns in a given location the way I originally did. The second approach is the simplest of the two, at least when it comes to describing it. I am however mindful of the fact that even though I was looking for interesting forms and patterns I was also trying to maximize the potential variations of subject matter. In doing so I was looking for form and patterns in dunes, slot canyons, water, organic elements and canyon walls. I was therefore following, perhaps unconsciously, the categories I am featuring here. This was a different time for me, a time when thinking about photography and categorizing images was secondary to creating photographs. A career is an evolution. I now spend much more time reflecting on my work, planning projects, categorizing images and working on specific goals. My work today is more rigorous, a consequence of the evolution process that I just mentioned. The last category consists of images in which the forms and the patterns found in the landscape were my sources of inspiration. When creating these images I was looking for interesting shapes, forms, and patterns in the places that I was exploring. Most of those are in remote locations, far from popular areas, and I was always alone when photographing. The southwest at that time was far less popular than it is today and I enjoyed the loneliness and the quietness that comes with it. I am not sure if or how this influenced my photographic work. It must have in some ways. What I do know is that it made for a pleasant experience, one of contemplation and exploration as much as of photography. In many ways, I was inspired by this exploration process as much as by the locations I was discovering. The images you see here being both artistic expressions and treasured keepsakes. While I worked on these images, both selecting and preparing them for publication, a number of reflections came to me, as they often do when I am absorbed in a task and left to myself. These reflections, or remarks as I call them here, are featured below, separated by topic. 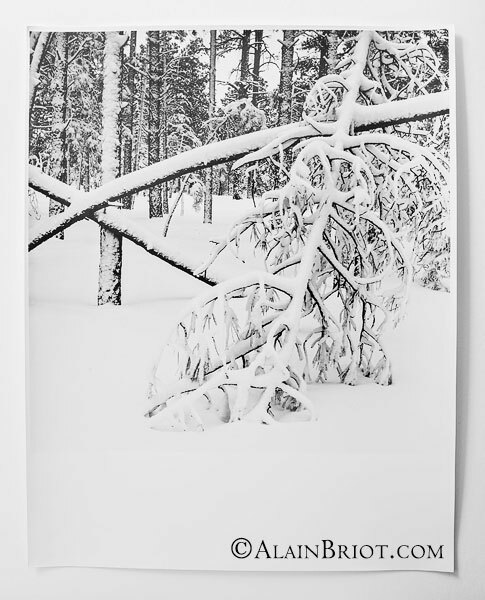 I quickly noticed the large number of square photographs featured in this collection. The square is a difficult format to compose with because all sides are of equal length meaning that you cannot use the height or the width of the frame to emphasize the composition. The composition has to work within the frame, not because of the frame. This is a format I worked with extensively in my film days, essentially because I was working with a Hasselblad Camera for a long time. While I eventually moved to 4×5, the cost and the weight of 4×5 gear kept me away from large format for a long time. I am now starting to return to the square format because of the advantages that it offers and the fact that it is now rarely seen and therefore ‘different’. I have in fact just completed a new series of square images of canyon scenes. I may feature it here in a future essay. 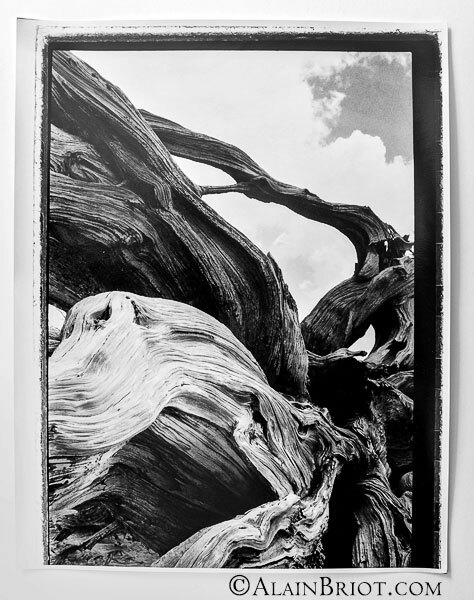 Looking at black and white silver prints brings an awareness that these are artistic interpretations and not documentary records of a given place. When I visit the same places today, which I do regularly, I create entirely different images. While the technology I use and the inspiration that guides me are radically different, the locations I photograph have seen little or no changes. They change on a geological time frame which for humans is virtually invisible. What has changed is me. 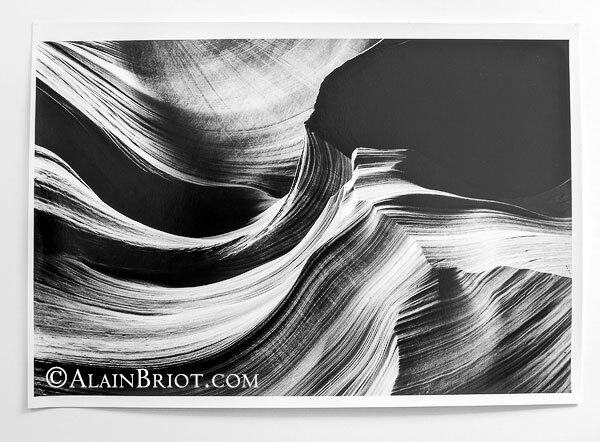 It is impossible not to notice the organic feel of a black and white silver print. 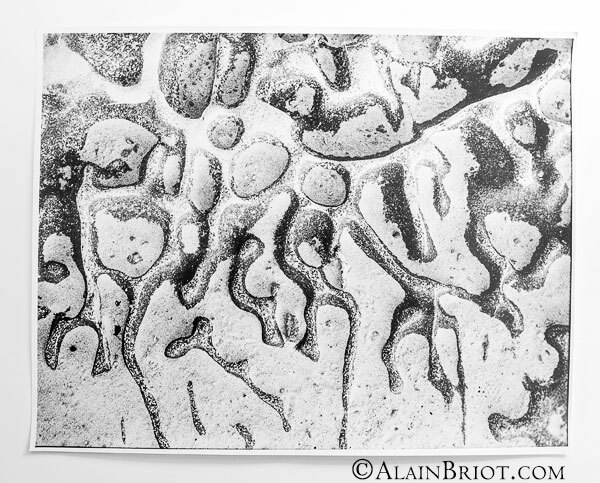 Even when the prints are photographed this organic feel is present in the images. It comes from the paper being wrinkled, the mottled look of some surfaces and the feel and smell of chemical processing. All these things are still present despite years spent in storage boxes. This feel also comes from the imperfection of film. No matter how hard I worked at making these prints as perfect as I could, be it during exposure, processing, printing and curating, film never had the perfection of digital processing. There is dust on the prints that needs to be spotted but was not because of lack of time and because I had so many prints to work on. 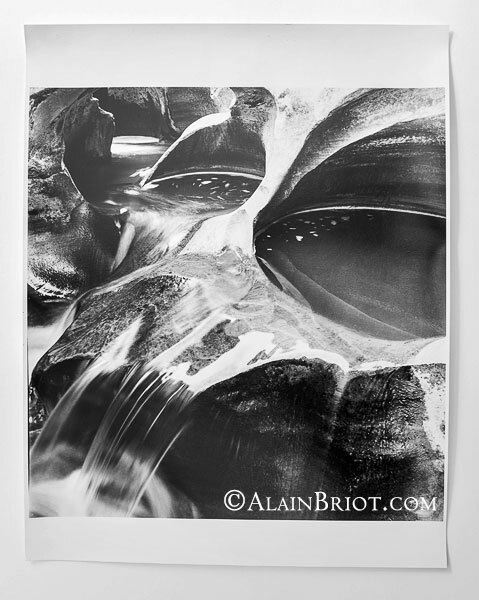 There are wrinkles due to the print being bent or just handled the wrong way during processing, washing and drying. 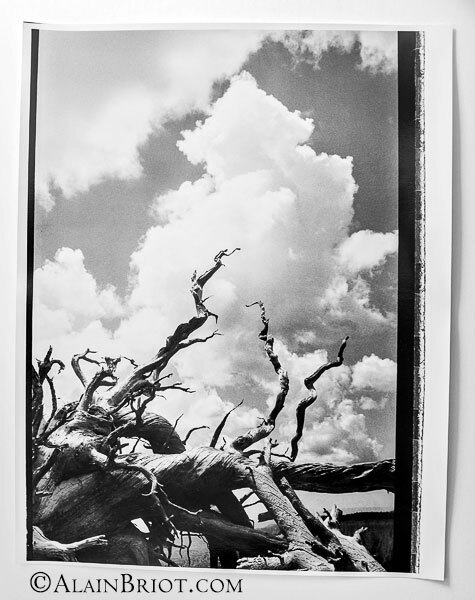 There are bent corners because of the drying process and the fact that black and white silver prints simply don’t lay flat unless they are dry mounted or at least flattened in a heat press. There are nicks and scratches here and there, specks of coating that came off, torn edges and a million other minor flaws that one simply does not see on inkjet prints. One could say that the silver print medium is imperfect. It certainly is, but then the inkjet process is also imperfect, just differently. What we see here is the comparison of two mediums, one recent and the other less so, with the older one coming across as somewhat lacking. However it is this lack that creates the unique beauty and attraction of a silver print. It is left wanting, as if waiting for improvements that never came because they could not come. What was wanting was not to be had, the medium being the generator of the defects, if defects they are. Each medium has its imperfections and overcoming them as best as we can is the challenge. 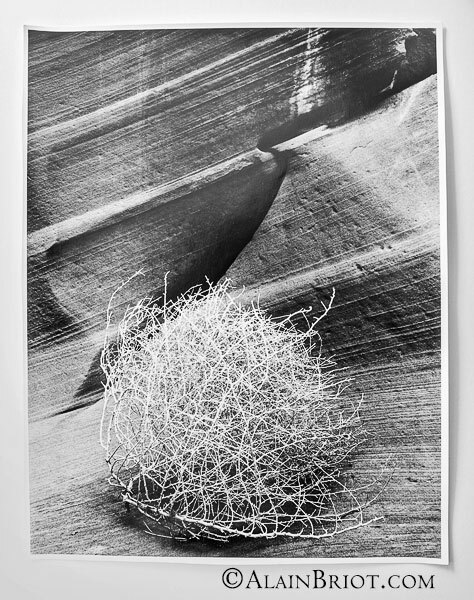 This challenge is met differently with chemical and with inkjet prints, resulting in a different feel, a different type of organic quality, and perhaps a loss of tactile feel when it comes down to it. Of course there is nostalgia involved when looking at these prints. How could it not. After all these are souvenirs as much as they are works of art. Time makes it easier to see them as works of art because I no longer see these locations the way I saw them when I created these images. I see them differently today and this forces me to acknowledge that these are not documentary images, that these are not visual records but instead interpretations, departures from reality, and thus works of art and imagination. The distance brought by time and by technology allows me to distance myself from my own work, something which I cannot do with the work I am doing now. Today’s work is created with today’s technology and this forces me to exist in the here and now. It does not allow me to distance myself from the work I do or the medium I use. The beauty of looking back, when one can, is that it brings distance and allows one to look at one’s work as if it was someone else’s. Creating successful abstract images calls for seeing the subject as shapes, forms, and patterns rather than as factual elements. Instead of seeing a canyon wall, for example, you see the curves of the wall and you focus your attention on photographing those. You, therefore, photograph with the intent of showing only specific parts of the subject rather than the whole subject. You are not concerned with making the subject recognizable, you are only concerned with making the subject aesthetic, or intriguing or reminiscent of something other than itself. 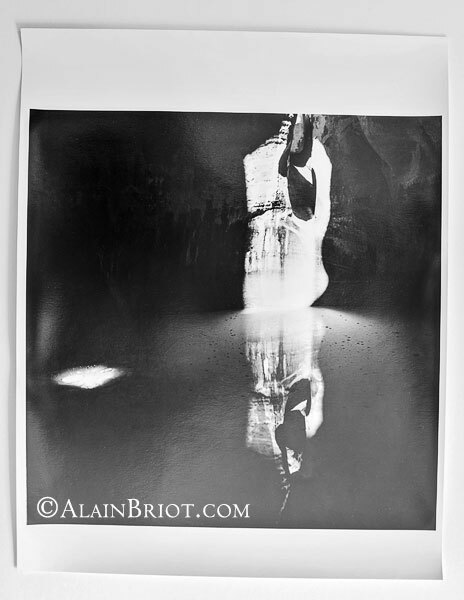 An abstract image takes the viewer beyond the obvious and makes him or her look at that subject in a new way. Instead of seeing a canyon the viewer sees shapes and patterns that they may not have noticed before. Instead of thinking about a canyon they think of what these shapes and colors mean to them, of what they evoke in their mind, of the memories they bring back or the dreams they bring forth. Abstract images make the viewer think instead of look. Because they do not reveal the subject immediately, or at all, they force the viewer to find other meanings to the image. These new meanings are found not in the subject but in the image itself, in the arrangement of the shapes, in the selection of patterns, the textures and the light that the artist depicted in the image. 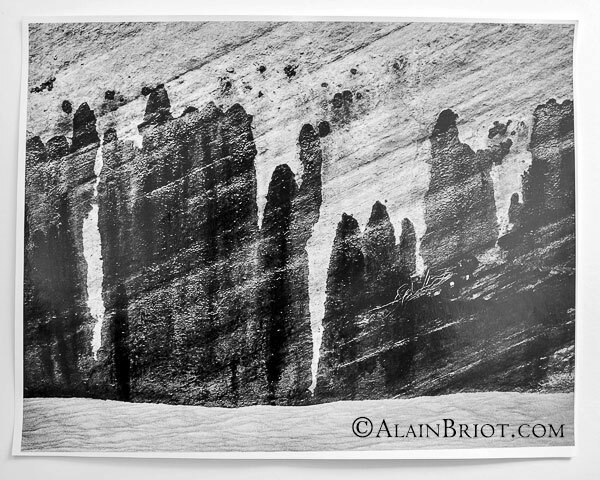 It is when the real gives way to the unreal that a successful abstract photograph is born. This transition happens when the pleasure of enjoying the abstractions offered by the image is more powerful than the desire to find out what the subject is. If you enjoyed this essay you will enjoy attending a workshop with us. I lead workshops with my wife Natalie to the most photogenic locations in the US Southwest. Our workshops focus on the artistic aspects of photography. While we do teach technique, we do so for the purpose of creating artistic photographs. Our goal is to help you create photographs that you will be proud of and that will be unique to you. The locations we photograph include Navajoland, Antelope Canyon, Monument Valley, Zion, the Grand Canyon, White Sands and many others. Our workshops listing is available HERE. I create fine art photographs, teach workshops with Natalie and offer Mastery Tutorials on composition, image conversion, optimization, printing, business, and marketing. I am the author of Mastering Landscape Photography, Mastering Photographic Composition, Creativity and Personal Style, Marketing Fine Art Photography and How Photographs are Sold. All 4 books are available in eBook format on our website at this link:. Free samples are available so you can see the quality of these books for yourself.